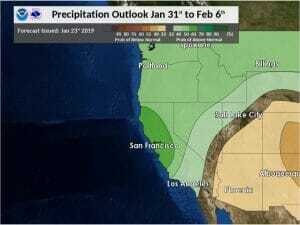 January 25, 2019 – Dry weather through the middle of next week. Daytime high temperatures will be as much 5 to 15 degrees above normal through the weekend. Slightly cooler early next week. Precipitation chances returning to interior NorCal by the end of the extended period next Thursday and Friday. High amplitude ridge over the eastern Pacific conditions to dominate the weather pattern bringing dry conditions for the next several days. Fair skies over most of the CWA this morning with just a few high clouds spilling over the ridge and across the north state. Some light fog has formed this morning in the central valley from about Sacramento southward. Light northerly breezes have kept fog out of the valley farther north. Airmass continues to warm so should see high temperatures today from 5 to 15 degrees above normal. 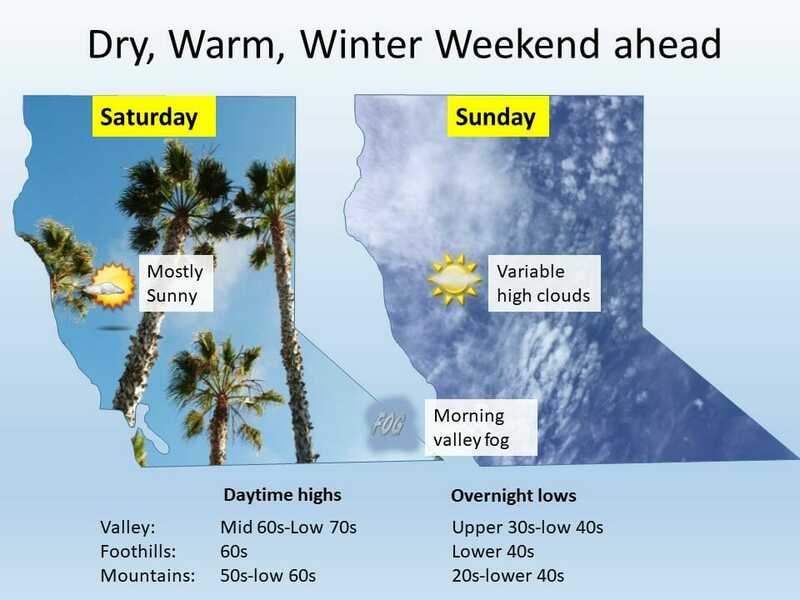 Northerly surface gradient and upper level northerly flow will keep northerly breezes going tonight and Saturday so valley fog conditions should be about the same tonight and Saturday morning. Upper ridge axis forecast to center over the west coast on Saturday so warm dry conditions continue. A weak system passing to the north of the ridge and through the Pacific Northwest will bring some high clouds to the forecast area but otherwise not expecting much change on Sunday. Pressure gradients weaken slightly for lighter winds but conditions remain somewhat dry for January so nighttime fog should remain fairly minimal early next week. Little change in overall pattern is expected on Monday but high cloud cover may bring a little cooling of daytime highs. By Tuesday, ridging is still present over the eastern Pacific, with dry conditions and above average temperatures expected. From Wednesday onward, models struggle with the overall pattern although there is increasing confidence for a pattern change by next weekend. The ECMWF is much quicker bringing compact, mid- level low towards northern California Wednesday night. There is an increased potential for precipitation through the end of the week into the weekend as the GFS and ECMWF has come into better agreement of a trough nearing the west coast Friday. High temperatures next week continue to be above normal with low temperatures around climatology each night.